Noah Baumbach's 2014 film is one man's quest for authenticity. About midway through While We're Young, documentarian Josh (Ben Stiller) pitches an ambitious idea to a potential financier: he wants to make a film that is both personal and commercial, something of profound social importance that is also entertaining enough for all audiences. But the financier (a twenty-something trying to imitate Don Draper) wants an easy tag line, something he can put on a poster. Josh leaves frustrated, 44, and running out of opportunities to make his mark. Worst of all, he has no idea what that mark will be. All of that changes when he meets Jamie and Darby (Adam Driver and Amanda Seyfried), a Millennial couple who breathe fresh life into his dying pursuit. While We're Young is an honest and long-overdue examination of authenticity from a writer/director often plagued by ironic distance and insincerity. The film could easily be misinterpreted as an angry Gen-Xer's attack on Millennial culture, but it's really a critique of Gen-Xers themselves, typified by Josh and his wife Cornelia (Naomi Watts). Their needless defiance poisons their relationship with friends Fletcher and Marina (who have just crossed the threshold into parenthood and hang out almost exclusively with new parents) as well as with Cornelia's father, Baby Boomer and documentary icon Leslie (Charles Grodin). Once Leslie's protege, Josh is now too proud to listen to his father-in-law's advice. Cornelia is a talented producer (she used to work with her father), but several miscarriages and her husband's stagnancy have led her to a state of quiet, tacit acceptance of an unfulfilled life. But Jamie and Darby are different. They raise chickens in an apartment and make ice cream just because. Their entire life is a never-ending adventure of ironic badminton and Pabst Blue Ribbon. Not only does Jamie (a fellow documentarian) respect Josh's work, but he seems to live the authentic and carefree life that Josh was too rigid and uptight to pursue himself. Jamie and Darby feel no pressure, have no expectations, and have no one to rebel against. Josh marvels over Jamie's generosity and kindness (Driver's "praying hands" bit is a wonderful display of supplication) and Cornelia finds Darby's rejection of traditional gender roles to be a refreshing change of pace. The analog vs. digital motif displays this best: the old guys are using technology to feel young, but the kids are listening to vinyl and watching VHS tapes. For a time, While We're Young seems to convince us that the sensitive Millennial hive-mind will cure the Gen-Xer's grungy individualism: Jamie's documentaries (short bursts of clickbait creativity like Who's the Most Famous Person in Your Cell Phone?) are relaxed and rough around the edges, whereas Josh's (six hours of Marxist economic theories and military industrial history) is a didactic and joyless mess. But Josh quickly learns that Jamie is masking a manipulative and ruthless attitude that serves only to promote his own agenda. Jamie's interviews are staged and his heartbreaking stories are stolen from his wife. He appropriates a formative commercial from Josh's youth as an ironic band name. "It's like he once saw a sincere person and has been imitating him ever since," Josh laments at one point. From here on, While We're Young uses the complicated ethics of documentary filmmaking as a vessel for conflict between three generations with distinct values and ambitions. Noah Baumbach's sense of masturbatory self-importance can be frustrating (Frances Ha), but it can also be revelatory when he's got a true narrative to develop (The Squid and the Whale). 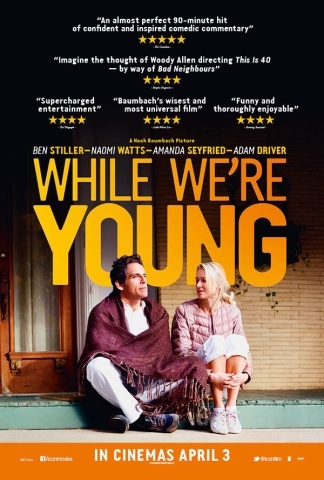 Thankfully, While We're Young has something real to say about getting older and dealing with limitations. Ben Stiller (a Gen-X icon thanks to Reality Bites) is the right fit here; the audience finds it as hard to believe he's almost 50 as he does. Thanks to Girls (and soon, I expect, The Force Awakens) Adam Driver is the soulful, artisan, Millennial man-boy. While Jamie can be a frustrating caricature at times, Baumbach wisely resists vilifying him. "He's not evil," Josh eventually admits, "He's just young." Seyfried and Watts carry a graceful sadness, both feeling unfulfilled in their marriages and resenting their husband's attention to private ambition. There are a few plot beats that don't quite land (the resolution of the miscarriage issue doesn't feel earned), and Josh is outwardly self-aware in that awful movie character way ("You know what my problem is? "), but it's all in service of a very interesting journey across the generational divide. The film's thesis might best be summed up when Josh jumps to "get the check" at a restaurant and Jamie fails to protest. Doing the check dance (a gag out of Seinfeld) would never occur to the entitled young man, leaving Josh asking himself what he's trying to prove by offering to pay. While We're Young is ultimately about ambition, creativity, ownership, and the value and pursuit of experience. It's about the way we pose and posture for each other, and it asks us all what we're really trying to prove. Rob DiCristino writes and podcasts for The Ugly Club. Follow him @RobDiCristino. He mostly tweets about Ben Affleck.